The beautiful mountains and high elevations of our Colorado golf schools can help you take your game to soaring new heights. We offer two locations for you to experience the beauty of Colorado and the stunning natural landscapes of the Centennial State, all while perfecting your swing, whether you're a beginner or an expert. Surrounded by alluring Aspen pines and forests, or winding along river shores, our Colorado schools offer lessons from PGA pros for a phenomenal way to enjoy a vacation in Colorado. Contact us today. 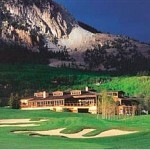 Our golf school location at Crested Butte is one our most spectacular. This championship mountain golf course is the ideal setting for your golf instruction. Designed by Robert Trent Jones II, The Club at Crested Butte, is surrounded by pine and aspen forests and dramatic mountain peaks.